While the Hive Lantern might seem to be a distant cousin of a beehive, it is actually more alien in its form and structure, relating to the biology of flowers (ovule, stigma, and petal) and imagery appropriated from science fiction. It consists of three spiraling lobes whose symmetry is obscured by an organic cellular structure that morphs across its surface. 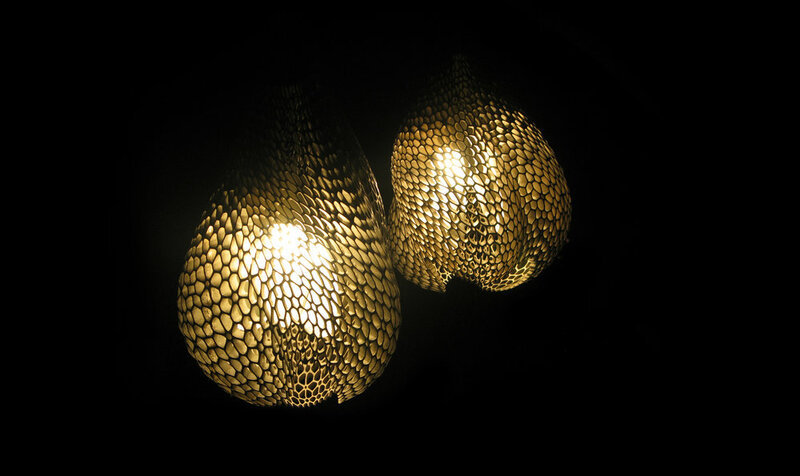 Varying cell sizes, shapes, and depths cast the light from three interior bulbs in a complex pattern. The parametric definition is simple, packing six basic cell units around the spiraling lobe form. The pentagonal cells share centers, creating a fluctuating hierarchy on the surface in which center stigmas share circumscribing petals. The thickening and thinning of the hive membrane is critical in order to control moments of increased light transmission while decreasing direct views to the bulbs. Each of the three lobes relates to one of the internal bulbs, selected to appear as unhatched seeds protected within. Each Hive Lantern is 3D printed from a digital model and plated in nickel. The hives’ outer faces are polished, suggesting the reading of a wind-weathered fossil. Since installing the hives on a rooftop garden terrace, adjacent birch trees and landscape have begun to mask the stainless steel support rod. Eventually the hives will be supported by the mature trees. 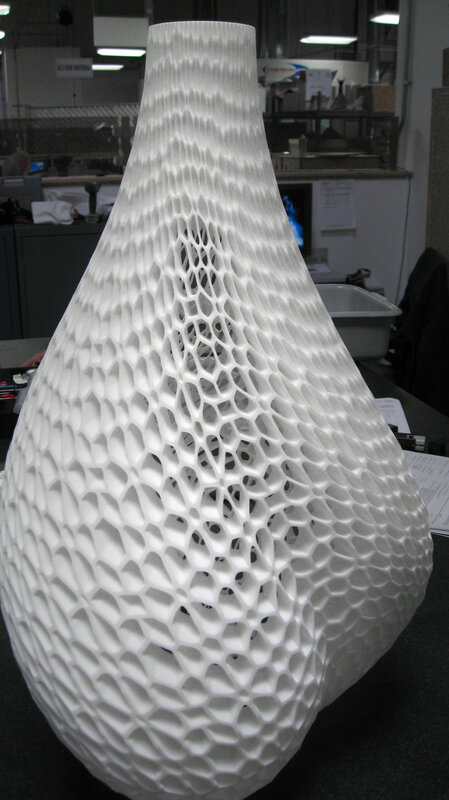 The Hive Lantern is the result of collaboration with Michael Young of the design firm Young and Ayata.